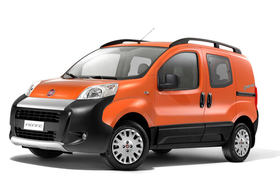 TURIN -- Fiat Professional achieved its 2010 sales target two years ahead of schedule, making the light commercial vehicle unit the only sweet spot for the troubled Italian automaker. The division boosted its global sales by 5.3 percent to 409,000 units in 2008 compared with the year before. As part of his revival plan for the automaker, Fiat Group Automobiles CEO Sergio Marchionne gave the light commercial unit a target to sell 400,000 units annually by 2010. Strong sales of the Ducato large van; the introduction of the Fiorino small van and success in Brazil helped Fiat Professional to reach the target ahead of schedule. In Brazil, the division boosted sales by 19.1 percent to 100,500 in a total market which grew 35.5 percent to a record 436,400 units. In western Europe, Fiat Professionals sales were down 5 percent to 240,600 units in a market where total sales fell 10.1 percent to 1.95 million. The division increased its market share to 12.3 percent from 11.7 percent in 2007. "We consolidated our No. 2 position in a declining western Europe market," Fiat Group CEO Sergio Marchionne said in a call with analysts. PSA/Peugeot-Citroen is the No. 1 seller of light commercial vehicles in Europe. All Fiat's other brands reported falling sales last year. In total, Fiat Group Automobiles sales fell 3.9 percent to 2,153,000. Alfa's 2008 sales were hit by a long closure during the first quarter of its main plant in Pomigliano d'Arco, Central Italy, for retooling to improve poor quality. For Fiat Group Automobiles, 2008 was a year at two speeds. In the first 9 months, sales grew 3.8 percent to 1,725,000 units. In the fourth quarter, the credit crunch and declining consumer confidence led to sales plunging 23.6 percent to 428,000. Fiat Group Automobiles' trading profit for 2008 fell 13.9 percent to 691 million euros. The company's finances took a big hit in the final quarter, when declined by more than two-thirds to 65 million euros compared with the same period on 2007. Fiat expects light commercial vehicle sales to decline 16 percent to 1.64 million units in western Europe this year and by 17 percent to 362,000 in Brazil. Marchionne aims to keep Fiat Professional's market share stable in both markets despite the forecast steep decline.